On a recent college visit, I saw this sign hanging on a door. As human beings in this world, we come and go. Our time here is finite. We will be replaced by others. What is truly memorable about us is our relationships and how we treat others. When we show kindness to people or when we are cruel to others--these things are never forgotten. Our interactions are the mark of who we are inside--do we sincerely care about others and the bigger picture or are we just plain selfish? how that parent who loved you made you feel? how that teacher who taught you made you feel? how that friend who played with you made you feel? how that boss who mentored you made you feel? how that clergy who inspired you made you feel? how that spouse who was your companion made you feel? how those children who looked up to you made you feel? 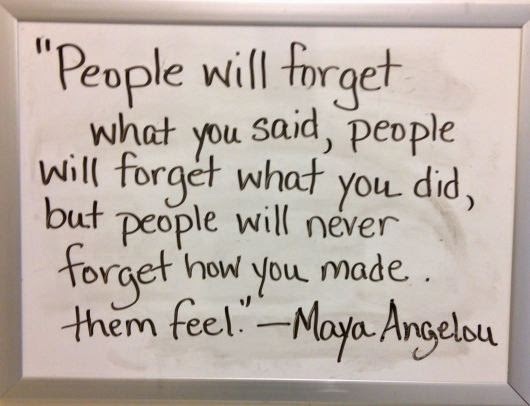 how those colleagues who supported your work made you feel? I'm sure you can also remember times when people made you feel not so good--perhaps, you scowled or even cursed them under your breath. Getting results in life is not enough--we can't do it by stepping on other people and really being successful that way. How Do You Kill A Pothole? Which Part of "Men's Room" Don't You Understand? Why Do People Take The Cheese Off?